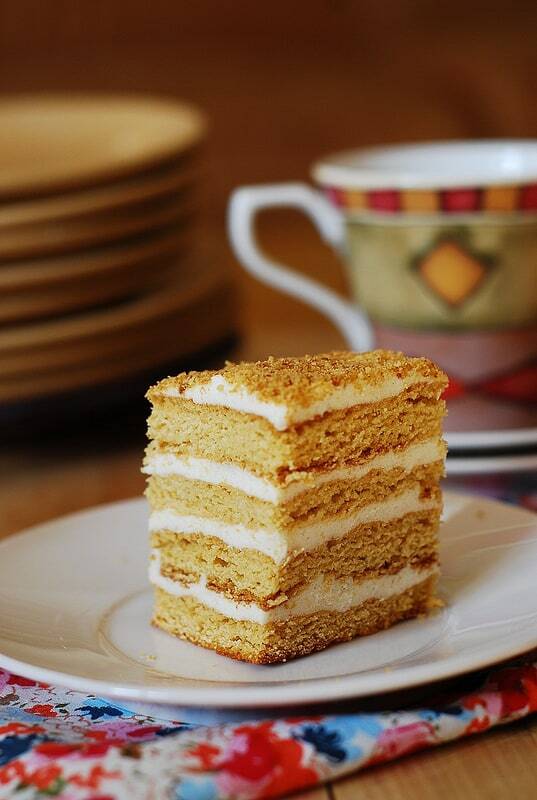 Russian Honey Cake with Cooked Flour Frosting – Medovik – a beautiful cake for a special occasion. 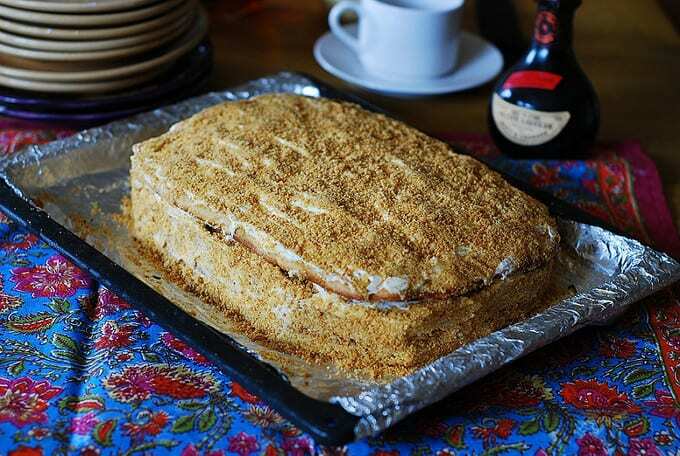 Today is a very special day, my blog’s 1-year anniversary, which I am celebrating by baking a very special honey cake with a very special cooked flour frosting. You should definitely make it at least once in your lifetime – just to see how great this frosting is! My mom has been using this frosting made with flour and milk all along for the last 40 years! 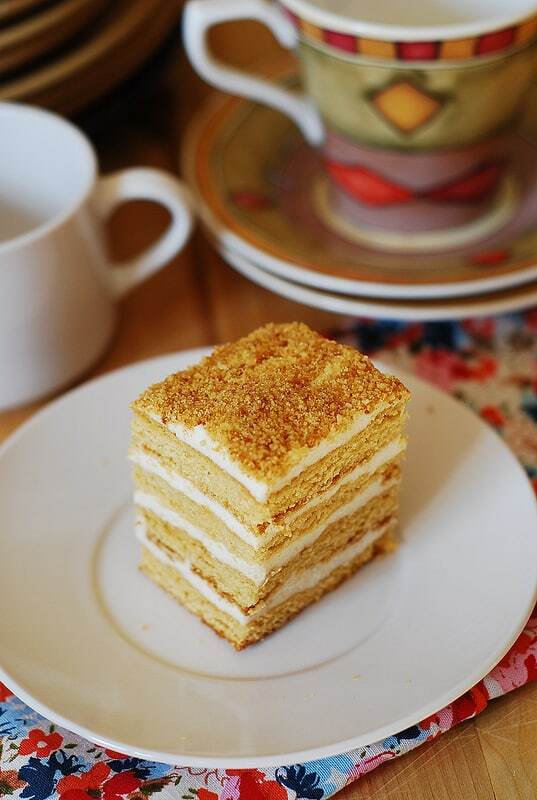 And it’s my mom’s recipe that I am sharing here – a recipe for my favorite Russian honey cake with cooked flour frosting – also known as Medovik Tort. 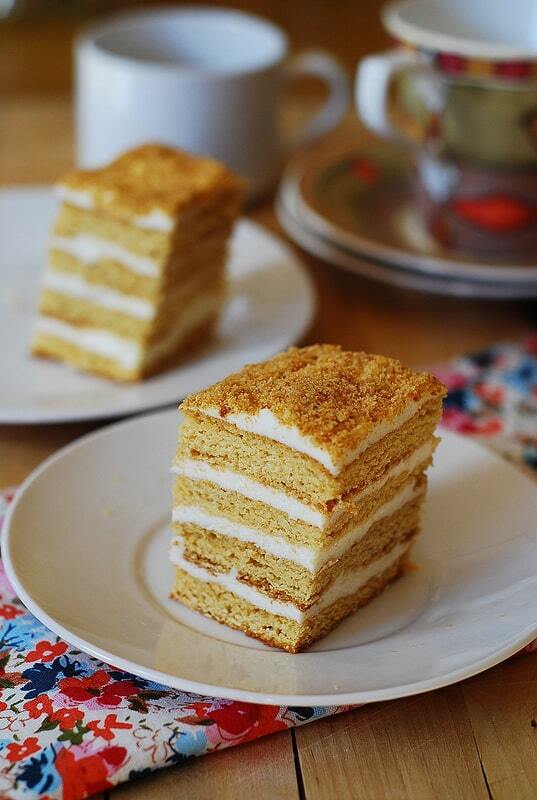 But, let’s go back to this amazing Russian honey cake with an amazing cooked flour frosting, shall we? Growing up, this was the cake that my mom would make every year for special occasions, and since it’s a 1-year birthday of my blog, it is only appropriate to celebrate it with this cake, isn’t it? This honey cake is definitely a celebratory cake, perfect for parties, birthdays, or anniversaries! I urge you to try it, if only to get a taste of this delicious frosting made from flour and milk – one of the best you’ll ever try! It’s much lighter than buttercream frosting, as it uses less butter because we’re using flour/milk slurry as a thickening agent or butter-replacement here. The cooked flour frosting is also amazingly easy to spread and pipe. All-in-all it’s just a great, lighter cake frosting! The cooked flour frosting is essentially made by cooking flour and milk mixture, constantly stirring, on low-medium or even high-medium heat until it really thickens and all lumps dissolve. Separately, room temperature butter and white sugar are beaten really well, using electrical mixer. Then, the cooled flour/milk concoction is gradually added to the butter/sugar mixture and beaten until very creamy and smooth. It is very important that you use all purpose white bleached flour! If you use unbleached flour, your frosting will not be white in the end! It’s a very special cake, and I loved it since I was a kid. 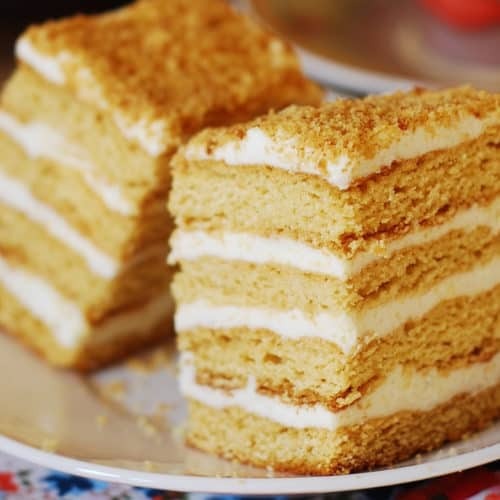 Even though it’s called honey cake, a relatively small amount of honey is used: only 1/4 cup for the cake batter, and there is no honey in the frosting cream. 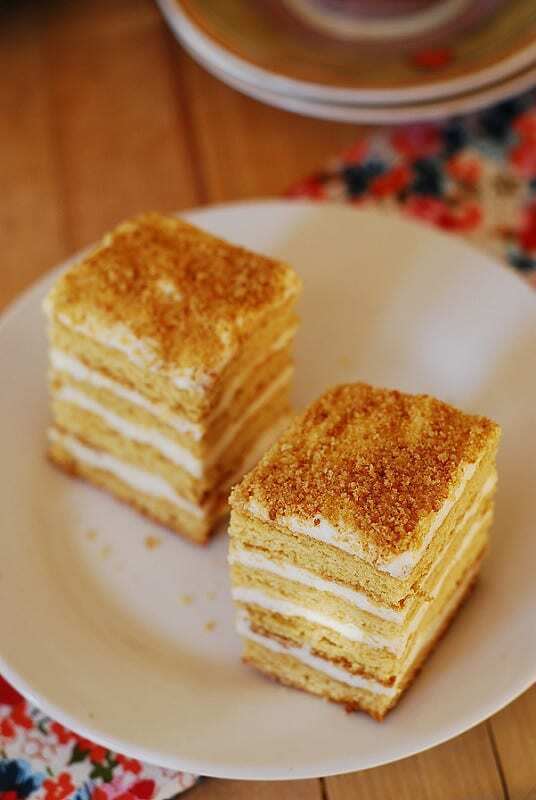 Yet, even this small amount of honey gives this very subtle and delicious flavor to the whole cake. And, don’t forget that you will spread this cake with the most amazing cake frosting made from a slurry of milk and flour! 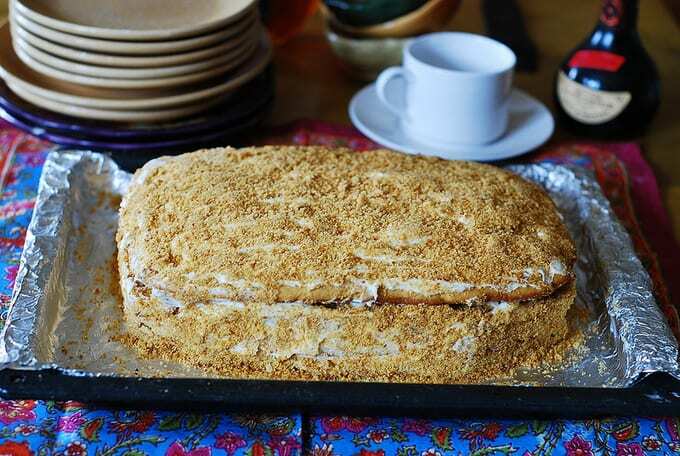 A very special honey cake with a very special cooked flour frosting. Perfect for special occasion! In a medium pan, add 1 cup sugar, 1/4 cup honey and 1 stick butter – heat it up on low heat until everything is blended well together: honey softens up and sugar dissolves. In a large mixing bowl, whisk 2 eggs and 1.5 teaspoon baking powder until well combined. Add heated honey mixture from step 2 to the eggs mixture and stir until everything is well incorporated. Let the mixture cool down. When the mixture has cooled off, add 4 cups flour and whisk until just combined. You will have a pretty thick cake batter. Divide the cake batter in 4 portions, because we will have 4 layers of cake. Line 2 cookie sheets with foil, spray with non-stick spray. Using your hands, roll out the the first layer of the cake batter onto the lined cookie sheet, spreading the batter across the sheet. I usually run my hands under cold water, shake off some excess water and use wet hands to handle the dough – that way it doesn’t stick to your fingers. I actually use my hands to spread the batter across a cookie sheet and form a rectangle. I repeatedly rinse my hands with cold water (shaking off excessive water) to help spread the batter. Roll out the second layer of the cake batter onto the second cookie sheet sprayed with non-stick spray. Bake both sheets at the same time for 15 minutes at 350 F. When they are done, they should turn golden brown color. Remove from oven and remove the foil with the cake layer onto the cold surface to cool off. In the same manner as described, prepare the 2 remaining layers of the cake batter on the same cooking sheets, using new sheets of aluminum foil. Also, bake for 15 minutes. Let all 4 layers cool completely. Trim the edges so that all layers are the same size. Using food processor, finely chop the edges you just sliced off to create finely crumbled mixture which you will use to decorate the cake in the final step. In a medium mixing bowl, whisk 2 cups of milk with 1 cup of flour until very well combined. The mixture in its thickness should resemble crepe batter (if you ever made one :)). It is very important that you use all-purpose white bleached flour! If you use unbleached flour, your frosting will not be white in the end! Add this mixture to a small pan and heat it up on low-medium heat, until mixture thickens and starts boiling, constantly stirring. At this point your mixture will start thickening really fast and will not be liquid any more – it will turn into very thick dough-like mixture, and will have lots of big clumps – that’s OK. Remove from heat, and continue stirring the hot thick mixture until all clumps dissolve – and they will dissolve easily at this point. You will have a nice slurry of flour and milk. Continue stirring the mixture until it somewhat cools down – it will help prevent it from sticking it to the bottom of the pan. It will be pretty hard to stir it as the mixture should be very thick. Allow this slurry mixture to completely cool down, occasionally stirring. You might even put it in the refrigerator. In a large mixing bowl, using electric mixer, beat 2 sticks of butter with 1 cup of sugar until very creamy and white. When the slurry of flour and milk from step 1 is cooled, add it gradually to the large mixing bowl with butter/sugar mixture, and continue beating, using electric mixer, until well incorporated and thick. Place the cream in the refrigerator to cool further. Place one of the four cake layers on a large serving platter, spread 1/5th of the cream over the top. Place the other cake layer on top; spread another 1/5th of the cream over the top. Repeat with 2 remaining layers. Spread the remaining cream over the the four sides of the assembled cake. Sprinkle finely crumbled mixture (That you made in the food processor earlier) all over the top and the sides of the cake. 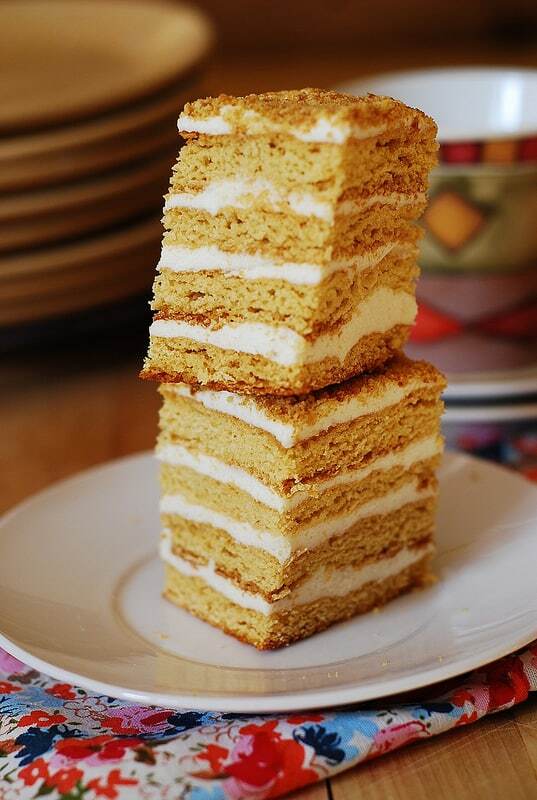 Keep the cake in the refrigerator, and it only gets better the next day, when the cake layers soak up some of the cream and puff up, making the cake even taller. The cake batter would be pretty thick but it shouldn’t be crumbly. I always use sifted flour so I would suggest sifting the flour first, before measuring it. To spread the batter on the cookie sheet, I usually run my hands under cold water, shake off some excess water and use wet hands to handle the dough – that way it doesn’t stick to your fingers. I repeatedly rinse my hands with cold water (shaking off excessive water) to help spread the batter. Will a hand mixer work just as well as a stand mixer when making the frosting? The recipe says to use 4 cups of flour for the cake but in the instructions it says to add 4.5 cups, which is the right amount? It’s 4 cups flour. I just corrected the recipe. Thank you for noticing and letting me know! I’ve pinned this recipe and my readers seem to really like it. 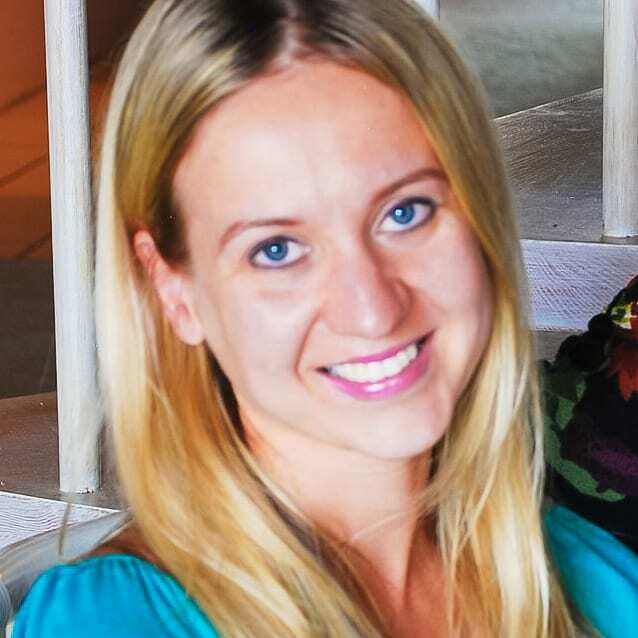 Happy 1 year to your blog Julia, fun is just getting started :). Your version of the cake looks and sounds great!! As you know (you commented on my post) – I made a little different version of this cake. I am so intrigued by this cooked flour frosting concept. It seems like a lot of flour in the frosting! But I am all about less butter, so I definitely want to try this! Erika, it is a lot of flour in the frosting, but trust the recipe! 🙂 (and, don’t forget to sift the flour to avoid overpacking the flour in the measuring cup). I also use 2 sticks of butter and 1 cup of sugar in this frosting – so 1 cup of flour is just the right amount to thicken 2 cups of milk and thicken the frosting. It will come out wonderful! I made it many times. 🙂 The really difficult part of the recipe is to be very patient with the flour-milk slurry and let it boil and yet not let it overcook, stirring at all times. And, it’s key not to overpanic if you see too many lumps forming in the process. 🙂 All lumps should disappear if you continue stirring and follow the recipe. Thank you, Julia, you’re very sweet! 🙂 This cake is always my # 1 choice for a celebration cake! Just give me an excuse to make it. 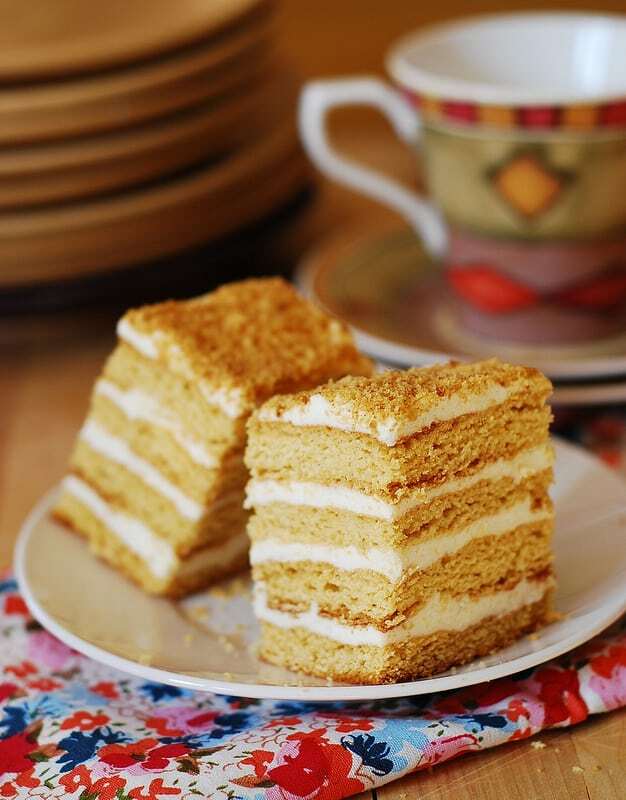 🙂 I checked out your medovik cake – oh mine, those caramel flames are unbelievable! I love it how you dressed it up, and it looks like a fine French dessert on the outside :).